Stage Plot - Charged Particles: Jazz with a Spark! The artists need full and exclusive access to the performance space beginning two and one half hours prior to the start time of the concert. The artists will have completed their setup and sound check by 30 minutes prior to the start time, at which point audience members may enter the performance space. The artists will need to be met by a representative two and one half hours prior to the start time of the concert at a specific location. Assistance of one person will be needed to help with equipment load-in. A large rolling cart will be needed at the load-in point to facilitate transportation of the equipment to the stage. A table and chair will be needed in the lobby of the performance area for displaying and selling the band's CDs and cassettes. It would be appreciated it a person could be provided to staff this table. 1. Name, address, and 2 telephone numbers for the sponsor's contact person. 2. Meeting place at the performance location, with exact driving directions from Columbus, Ohio. 3. 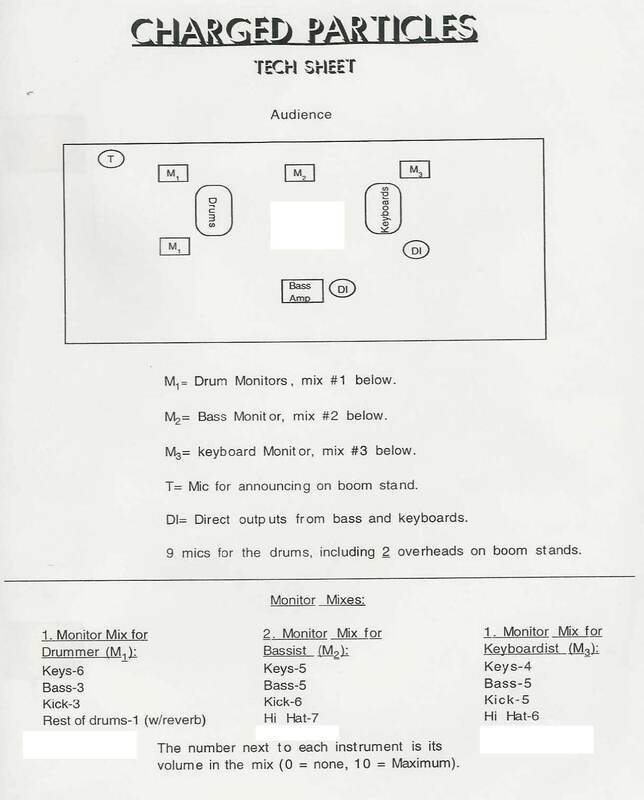 Written listing of the brands and models of sound equipment to be used at the performance. 4. Written confirmation that necessary lighting equipment will be provided and staffed. 5. Name(s), telephone number(s), and best times to reach the person(s) who will provide and operate the sound equipment. 6. Name(s), telephone number(s), and best times to reach the person(s) who will provide and operate the lighting equipment. 7. Number of audience seats in the performance space. 8. Names and telephone numbers for local radio stations, newspapers, and magazines that might be willing to provide coverage of or promotion of the performance. 1 The concert may begin with an introduction of the performers by the sponsor. 3 The drummer will come out in darkness and begin to play softly. 4 When the drummer first hits the snare drum, a spot light on him should begin to fade up as slowly as possible. This fade should take at least one full minute and longer if possible. 5 When the drummer begins playing the cowbell, all stage lights should suddenly come on full. 6 After this, stage lighting can stay on full for the remainder of the concert. 7 At various points during the concert, each of the performers will play by himself At these times, the follow-spot should focus on the solo performer, with the other stage lights becoming less bright. Then when the entire band begins to play again, the stage lights can return to full strength.